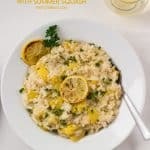 Creamy and bright-flavored risotto. Perfect for spring and summer! Using sauté setting - add oil, then add the onions and cook for 3-4 minutes or until softened, stirring frequently. Add squash, garlic, salt & pepper and cook for about 2 minutes. Then add the rice and cook for 1 to 2 minutes, stirring frequently - doing your best to toast each grain of rice. Add the wine, mix well, and cook for about 2 minutes (until evaporated), stirring constantly. Pour in the stock and mix well. Close the lid and steam vent, then switch setting to manual for 4 minutes at high pressure. Once cook time is complete, quick­-release pressure, then open lid. Turn off power to avoid overcooking. Add lemon juice, lemon zest, parsley, and parmesan - mix well. Serve immediately if possible. If not, do not cover while waiting or rice will overcook. Enjoy!